Hi loves, I'm back with some k-beauty this round, so excited when I was given a chance to try out SHO Aging Red Ginseng Ampoule and SHO Aging Red Ginseng Mask. Ginseng is often used as an anti-aging ingredient because it is rich in vitamins, minerals, anti-oxidants and it has many phytonutrients, that helps rejuvenates the skin resulting firmer, younger looking skin. 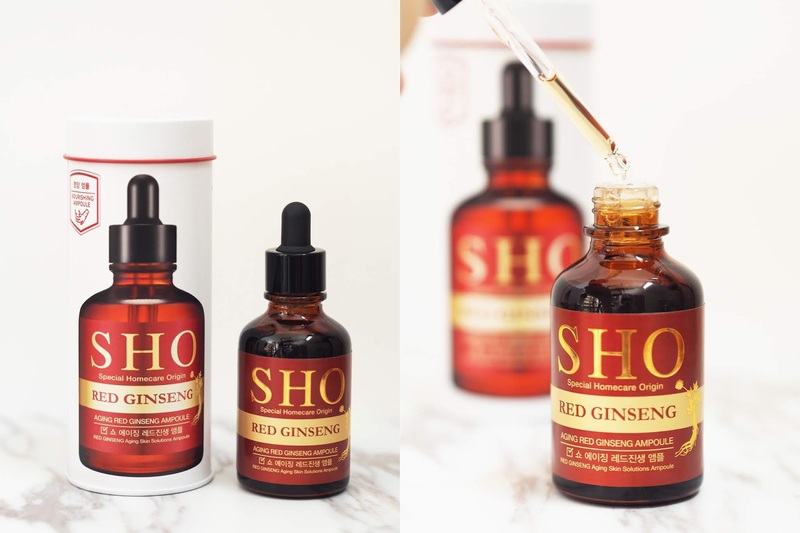 SHO Aging Red Ginseng Ampoule claims to keep the skin healthy and glowing by supplying skin with an abundance of nutrition, it is designed to be used daily, is three times more effective compared to serum and instant results can be seen just after one application! The ampoule is loaded with 42% of red ginseng extract along with other ingredients such as Camellia Oil, Paeonia Suffruticosa Root extract, and Morus Alba Rooat extract. The SHOAging Red Ginseng Ampoule has a thick consistency and it's lightly scented with Ginseng, two drops is how little you need for your entire face. Upon application, it absorbs quickly into the skin and I love how it doesn't leave a sticky after feeling to my skin. I recommend adding this Ampoule after toner before moisturizer for the best result. I am really happy with this product because it's lightweight and fast absorbing, I can feel my skin being supple every time I use it. As I open up the packet, I noticed the mask itself is practically swimming in a pool of ampoules, after applying the mask, do not forget to scoop the remaining essence out, I just apply the extra all over the mask and onto my neck and left it on for 15 minutes. The SHO Aging Red Ginseng Mask is made from organic cupra mask sheet that is not easily torn or stretched, it fit well and sit properly on my skin and the access ampoule is not easily flown down to the side of my face, it my first time using this type of mask and I notice it holds the product on the skin longer. After removing the mask, I skin felt so refreshed, you could see the noticeable "boost" in my skin, it feels cleaner and more radiant and my under-eye dark circles and puffiness have gone. On top of that, when I woke up the next day, my skin was still moisturized and it's glowing and dewy. Overall, I am impressed with SHO Aging Red Ginseng Ampoule and SHO Aging Red Ginseng Mask. I've been using it for a month now and I am seeing excellent results, not only does it give me glowing skin, I noticed an improvement on how my skin retained its moisture, especially during the night when my skin tends to dry out. Besides that, I've also mixed SHO Aging Red Ginseng Ampoule with my moisturizer and my foundation for the added boost effect for my skin and it is working really well. SHO Aging Red Ginseng Ampoule and Mask is available online on SHO Malaysia Facebook and Instagram, they are also available in-store at selected Sasa outlets. The SHO Aging Red Ginseng Ampoule is selling for RM189 for 50ml and SHO Aging Red Ginseng Mask RM159 for 6 pcs of Mask, the new stocks that are arriving will have 7pcs in a tube! What's in my Wiggle Boks? Johnson’s® Baby of the Year Contest is back!